Summary: This article offers a recap of understandings of the concept of grammar: what it is, and when, why, and how it matters. The author, alluding to the relationship between grammar and power, suggests that we should consider how to support students in communicating strategically. 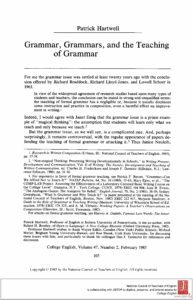 This foundational article offers a clear elucidation of the various ways in which people have understood the idea of grammar and would be an important resource for discussion among teachers of writing who invariably must, at some point, address the role of grammar in the teaching of writing. Why is the grammar issue so important? Why has it been the dominant focus of composition research for the last seventy-five years? What definitions of the word grammar are needed to articulate the grammar issue intelligibly? What do findings in cognate disciplines suggest about the value of formal grammar instruction?